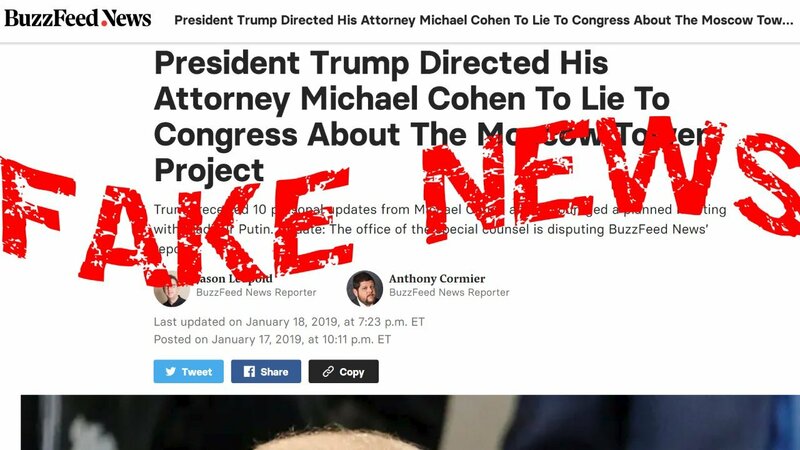 The Jan. 18 mistake by BuzzFeed, the notorious website which first brought us British MI6's faked-up Steele dossier against President Donald Trump, lays open the ongoing British intelligence coup attempt against the President, for defeat. The failing British elite, in chaos themselves, have spent since late 2015 targeting Trump more and more intensely, to keep him away from the White House or then to remove him, because of his intended policy of cooperation for peace and economic progress with Russian President Putin and Chinese President Xi. Now the American people can destroy this coup with a mass public demand that all the intelligence community's documents of 2016 and 2017 showing the sources of organized charges and attacks against the President, be declassified and made public. Some Congressional Democratic leaders will be exposed in the process, for having seen or been briefed on these still-secret documents, and lied about their contents. BuzzFeed's claim that Special Counsel investigators had given it evidence that Trump ordered one of his attorneys to lie to Congress, had to be immediately repudiated by legal assassin Robert Mueller himself. But this, only after half a dozen knee-jerking Democrats in Congress had forecast Trump's immediate impeachment or resignation because of it. Critically, EIR's Barbara Boyd has shown that BuzzFeed is an open U.S. component of British military intelligence's so-called Integrity Initiative (II). This II was created for propaganda and disinformation attacks on collaborators of Russia all over Europe, including Labour Party leader Jeremy Corbyn in the U.K., and most particularly, Donald Trump in the United States. This is the third patently faked, British impeach-Trump news story in the past three months, beginning with the London Guardian's wild one, quickly shown to be a fabrication, that Paul Manafort repeatedly visited Julian Assange at the London Embassy of Ecuador in 2016. The plain lying shows the coup planners clearly got desperate as President Trump began moving to withdraw U.S. troops from the Syria and Afghanistan wars; to London, those American troops are their Gurkhas, and must remain in the chaos the wars have created, to help divide and conquer developing countries and keep the entire world divided by geopolitics. This desperation has further exposed the coup attempt as by British intelligence. Trump's Syria/Afghanistan withdrawal plan also bears a relationship to his other initiative, his Jan. 17 missile defense speech which has brought up memories of Ronald Reagan's 1983 SDI speech. It is a relationship the President may not be fully aware of. A shift of American nuclear deterrence strategy from Mutually Assured Destruction to Mutually Assured Survival, cannot be done as an "add-on" to U.S. military spending and deployment dominated by the Anglophile war party which then, in 1983, was represented against Reagan by George H.W. Bush. That British-aligned war party goes back to President Harry Truman's subservience to Winston Churchill. Today, it absolutely prefers endless war in Syria and Afghanistan, and the removal of Donald Trump and his Mutually Assured Survival ideas. Missile defense requires a technological revolution in relativistic beam and related industrial technologies. It must be a crash program, involving many hundreds of billions in investment over a number of years. It requires getting all U.S. forces out of the seven or eight limited wars they are now in, eliminating the overseas war contingency budgets and much else. It must be a complete shift in overall strategic focus, which is transparent to Russia and China in particular, and which immediately invites them to collaborate in the same transformation. And it requires a parallel crash program in space exploration, also collaborative with other major space-faring nations, and enabling a Strategic Defense of Earth against potential immensely destructive asteroid and/or meteor strikes, for which the human race currently has no defense. An SDI like that designed during the 1970s by Lyndon LaRouche and in parallel by Dr. Edward Teller and collaborators, is hardly possible now without a big shift in economic policy, which the nation needs anyway. Look at "The Way Forward", the LaRouche Political Action Committee's new mass-circulation statement. It challenges Congress to enact LaRouche's Four Laws, beginning with Glass-Steagall bank regulation and a new national credit institution for productive infrastructure investment, and creating a fusion/plasma technology crash program and a revival of NASA space exploration. It goes on to propose a four-power agreement with China, Russia and India for a new credit system for international economic development. These new economic and scientific policies would be the underpinnings of any Strategic Defense of Earth, or any potential shift to Mutually Assured Survival. And for the President to take a leading role in such changes, as he may intend to, the British coup against him must be defeated for good, now.